Did you now how easy homebrewing can be? From Wikipedia, the free encyclopediaJump to navigationJump to search“Brewer” redirects here. 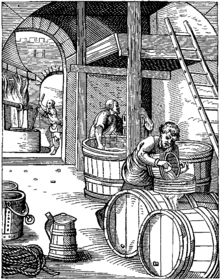 For other uses, see Brewer (disambiguation).This article is about the brewing of beer. For homebrewing, see Homebrewing. For other uses, see Brewing (disambiguation). The basic ingredients of beer are water and a fermentable starch source such as malted barley. Most beer is fermented with a brewer’s yeast and flavoured with hops. Less widely used starch sources include millet, sorghum and cassava. Secondary sources (adjuncts), such as maize (corn), rice, or sugar, may also be used, sometimes to reduce cost, or to add a feature, such as adding wheat to aid in retaining the foamy head of the beer. The proportion of each starch source in a beer recipe is collectively called the grain bill.